The introduction of high-dose therapy with autologous stem cell transplant (ASCT) for myeloma patients in the early 2000s led to a significant improvement in outcomes. Despite the further advances made with the introduction of novel agents, ASCT remains the standard of care for all eligible patients. Initial ASCT studies recruited only patients aged less than 65 years, but registry data suggests a recent increase in transplants for patients aged 65-75. There are few studies that directly compare ASCT to no ASCT in this age group and the upper age limit for ASCT in routine clinical practice varies around the world. We sought to evaluate the outcomes of older patients receiving ASCT within the UK NCRI Myeloma XI trial. The Myeloma XI trial, recruited patients to two pathways; one for younger/fitter patients considered transplant eligible (TE) and one for transplant ineligible patients (TNE). The choice of pathway was determined on an individual basis, based on performance status, clinician judgment and participant preference. Patients were randomized to receive either thalidomide or lenalidomide combined with cyclophosphamide and dexamethasone (CTD vs CRD, dose attenuated for TNE) for a minimum of 4 (TE) or 6 (TNE) cycles and to maximum response. Some patients with a suboptimal response received further induction therapy with a proteasome inhibitor based triplet (CVD). TE patients were planned to receive 200mg/m2 melphalan prior to ASCT. There was a maintenance randomization to lenalidomide, lenalidomide/vorinostat or observation. This post-hoc analysis compared outcomes for TE patients of different ages and those of age-matched TNE patients. 2042 patients were recruited to the TE pathway of the study with median age 61 years(y), range 28-75. 27% (546/2042) of TE patients were aged 65-69y and 5% (101/2042) aged 70-75y. Older patients were less likely to ultimately undergo ASCT than younger patients, despite having entered the TE pathway, (<65y 67%, 65-69y 55%, >=70y 44%). The reasons given for not undergoing ASCT were more often related to patient fitness in those over 65y. Median CD34+ cell collection also decreased with age from 4.6x106 <65y to 3.8 x106 65-69y to 3.1x106 >=70y. For those patients who underwent ASCT having entered the TE pathway (<65y n=931, 65-69y n=299 and >=70y n=44) median PFS shortened with increasing age but overall survival was not significantly different (Median PFS: <65y 46.5months, 65-69y 38.7m, >=70y 30.1m and OS: <65y 69m, 65-69y 63.8m, >=70y not reached). There was no difference in 100-day post ASCT mortality between age groups. 1852 patients were concurrently recruited to the TNE pathway with median age 74y, range 54-92. 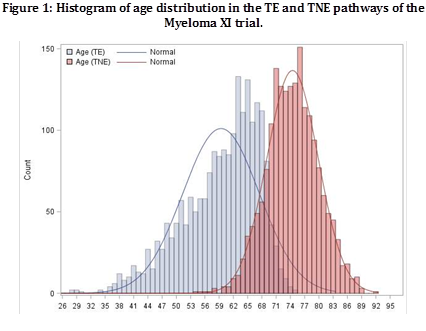 The TE and TNE patients’ ages overlapped as shown in Figure 1. We defined a group of best-age-matched patients between the TE and TNE pathways that comprised 389 TE patients who received ASCT (TE-ASCT), 310 TE patients who did not (TE-noASCT) and 382 TNE patients. Patients undergoing transplantation had significantly improved outcomes compared to those that did not, irrespective of whether ASCT had been initially planned (Median PFS: TE-ASCT 42.9m, TE-noASCT 15.9m, TNE 17.2m and Median OS: TE-ASCT 63.8m, TE-noASCT 46,1m, TNE 45.8m). These differences were independent of the use of ongoing maintenance therapy. Our data suggests that ASCT improves outcomes for newly diagnosed myeloma patients and supports its use as standard of care for all considered able to tolerate the procedure, without strict age limits.